Billy Meier’s “Love” Teachings 101: How to steal another’s wife? 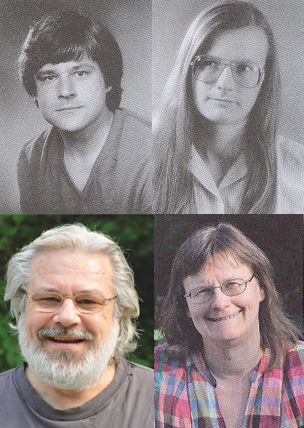 In response to our article on Methusalem’s exposé – especially the discussion around how Meier reportedly sexually exploited his female followers, few Meier supporters have wrote to us saying that Meier, the Prophet of New Age, would never have done such grotesque deeds and demanded us to either put up with proof or shut up. Well, we at BMUFOR decided to take up their challenge and have come up with the best available proof there ever can be – Meier’s own contact reports. The documented evidence that we will be analyzing for now however pertains only to the tragedy faced by the couple Eva Bieri and Louis Memper, who both officially joined FIGU on the same day i.e. on December 16, 1978. Meier, apparently tempted by Eva’s wealth and beauty, had invoked “Destiny” and “Teachings of Love”, and persuaded her – who was already by then conceived with a child – to break up with his soon-to-be-married life partner Louis Memper and to then live by his (Meier) side and serve his “mission”. On April 13, 1980, when the child (son Atlant) was born to Eva, Meier adopted him and more than a decade later he, who already was reportedly having an extramarital affair with her (and probably others), officially made her his life partner shortly after Kalliope left FIGU and divorced him. Semjase prods Meier to deliver his much-postponed talk with Louis Memper and Eva Bieri (Meier’s pet name for her is beetle) on their immediate separation as Eva’s “destiny” doesn’t correspond to this. She warns Meier that Louis would pose serious problems by making ownership claims, probably on his soon to be born child (Atlant). Therefore Louis should remove himself from the Core Group of FIGU because he simply won’t be able to bear and understand the (predetermined) relationship between Meier and Eva, and also about his child to whom he can’t be the father. She also indicated that the renewal of ET contacts would only occur if the rest of the FIGU CG members stop making noises about the Eva-Louis incident. Many of these CG members, according to Semjase, in their selfishness and lack of requisite mental evolution and understanding, will be jealous and create unrest and a great deal of uproar in the group. According to Plejaren’s probability calculations, one particular CG member will instigate Louis to oppose Meier. As a part of this new FIGU statute, Louis wouldn’t receive any information on FIGU matters and contact reports from Meier or even indirectly through any FIGU member (would be a violation if they do so), because it would be psychologically burdensome for him. Only after Louis separates himself from the group and overcomes ‘his serious personal problems’, can he be later reconsidered as a full CG member. Then later in the 126th contact (transcript right below) that supposedly occurred on Saturday, January 26, 1980, 1:53 AM, Semjase responds to Meier’s question on whether Louis – who was by then already “persuaded” by prophet Meier and his then life partner Eva to abandon her and their soon to be born child, in the company of Meier – would make a come back to the group or not. Semjase states that because of Louis’ ‘unbalanced and emotional nature’ an exact result cannot be calculated with great probability. Her calculations showed her that Louis will either make a complete departure from FIGU or a return in which case there will be serious difficulties ahead of Meier. ..But now, may I ask a question about Louis? What do you think, will he come back to the group or not? 120. I already gave you information about that. 121. The things are, however, somewhat muddled, and an exact result cannot be calculated with great probability. 122. The available facts allow a complete departure as well as a return. 123. But the matter starts itself apparently well. Can’t that be ascertained more clearly? 124. Unfortunately no, because Louis is still so unbalanced that unforeseeable possibilities can be of constant appearance with him. Does this mean that my fears could be true? 125. Unfortunately, with his unbalanced and emotional nature, those aren’t necessarily to be dismissed out of hand. 52. But just in time, I remembered Louis’ conduct, who similarly requested for himself a temporary exclusion from the core group for two years, which was granted by a core group decision, which was very valuable for Louis and brought several positive changes for him. But then during the 178th contact (transcript right below) that supposedly occurred on Monday, October 4, 1982, 8:00 PM, Quetzal reprimanded Louis for being lazy and shirking his duties and responsibilities at the FIGU center during the several weeks of his personal free time when he was unemployed, indicating that Louis returned back to the group. 25. You see things too pessimistically, my friend, even if some of the group members have also done wrong during the last time, such as Louis, who acted as a shirker. 26. Already for several weeks, he has been subject to unemployment, and he didn’t think it was necessary, during this time, to be active towards the mission in the center. 27. Most of his time as an unemployed person, he has pointlessly wasted, having made a cozy and lazy life for himself and having waited for roasted pigeons to fly in his mouth, without even giving a single thought to the fact that he could have used the time that was senselessly and pointlessly wasted toward an appropriate and useful work in the center. Stevens pleaded guilty to 3 out of a possible 10 counts of molestation of a child, 4 counts of furnishing obscene or harmful items to minors and 2 counts on the film and pictures charges. Meier in light of these growing serious allegations was forced to install a ‘television monitoring device’ in his workroom so that now everyone can apparently see what was happening inside his room. It is not known whether these “private” sessions were broadcasted live through a monitor installed outside the room or just recorded on tape for later playback if anyone questions his character. But again, who would dare confront the Prophet Meier by demanding to check his private room tapes, assuming they are properly recorded in the first place? And if anyone dared, wouldn’t his “destiny” suddenly change and he be voted (read kicked) out of the group by FIGU for not having enough faith in Meier’s prophethood and “Teachings of Love”? 22. But it is more than just primitiveness, what proceeded yesterday and the day before yesterday evening with you, and moreover with complete non-authorization, for what you did was perfectly acceptable and in accordance with the laws and commandments of the Creation. 23. There was no fault in it to be assessed by us, and we would have acted likewise in all the same cases. 24. However, you know how to judge everything better than we do. 25. But it all just confirms our former calculations, namely that the destructions come from your own group and from its outstanding members, as well as directly from your own family circle. 26. Presently, I am also thinking of Wendelle Stevens, who has been incarcerated as a result of a boundless primitiveness. 27. But now, my friend, one wants to do the same thing to you, in the same and in an even greater and more serious framework, whereby your own wife is considerably involved in this, as well as your daughter, who has also joined forces, for childish reasons, with the lost Thomas in this respect. 28. You see, that’s why I can fully understand, also the rest of us, why you have incorporated a television monitoring device in your workroom, so everyone can see what you’re doing inside. 29. It was the only solution for you, even if it is the most primitive one that we have ever experienced in our many hundreds of years of life. 30. In addition, you are now the only one in the community who no longer has his own personal space, where you could be alone for yourself. 31. In addition, the whole thing still entails that we can no longer stay in your workroom, where we loved it so much and where we felt at home, and in addition to this, in the future, you have to come to us, far away from all places and people, if we want to talk to you or if you call us. Do you know that I am tremendously happy and glad that you and all the others are here again? Evidently, you are also doing very well. Is everything with your health now actually in the best order? 1. I am also very glad and happy. 2. Sure, my health leaves nothing more to be desired. 3. Everything is now in order. That makes me happy; then your long staying away was worthwhile. 5. But with all of you, all sorts of things have happened in the meantime. One can, indeed, say that. 6. I also had to find this out, also that you didn’t act accordingly, as was recommended to you on several occasions. I know, you speak of Beetle and Louis, right? 7. Sure, it was suggested to you several times that you should speak with the two, that nevertheless, the duty should be fulfilled. I know, but I just can’t do it. 8. Yes, you act exactly the opposite, but soon, nothing else will remain for you other than to explain everything to them. 9. That will already be very soon. Then there is really no other way? 10. You know that it is so. Then, like it or not, I must bite into the apple, which doesn’t taste good to me at all. 11. So it will be. 13. Besides the fact that you are to talk with the two, there arises a serious problem with Louis, which will not be easy to solve. 15. Here, it can be absolutely certain that he will suddenly make ownership claims, in order to bind Eva to himself, which would be good in no way. 16. For this reason, I will transmit today’s contact conversation to you only when these things have largely been resolved. 17. Until then, you may give no exact information about these things in your group. 18. In addition, it will probably also be the case that we will interrupt our contacts until then, until the point in time when everything has been resolved conclusively or to a great extent. But that can take a rather long time. 19. Sure, perhaps even a whole year. 20. But this still isn’t certain; it will probably only be a few months. But that’s already a rather long time. 21. It is, indeed, but unfortunately, it’s unavoidable. 22. On the other hand, also several group members are faced with some decisions, which likewise should and must be awaited. 23. Which I may not officially explain to you, unfortunately, because we may not influence the group. 24. Moreover, you also have to make various and not exactly easy decisions. 25. In relation to your family, on the one hand, because this will, indeed, become larger in a short time, as you do know. ..But can you still tell me how long I should wait, before you will transmit the contact report to me? 86. I told you, nevertheless, that a number of decisions must be awaited and that everything or at least very much stands in connection with the further growth of your family, because you will receive additional duties as a father, if everything develops and adjusts in such a way as is foreseen. 87. This depends, however, on whether or not new wrongdoings are committed again and once more by the group members, which could destroy everything. 88. But just of that, we are not so sure, because the past years have sufficiently proven to us that many group members are so caught up in their selfishness that they thoughtlessly destroy very much without hesitation. 89. The growth of your family by another two life forms will already release a great deal of uproar and jealousy in the group. Do you mean, actually, that Eva and her child will be the occasion for that, as well as the fact that I’m not the child’s procreational father? 90. Sure, and you know that very well. 91. Thus, it is illogical that you ask about that. You’re right, but on the other hand, it was already spoken once of the fact that offspring are necessary. 92. Sure, but it will not be pure joy to various group members, that you will then newly be a father, particularly because Eva was, before then, still Louis’s bride. I understand. Because Louis won’t be the father, that will provide some stimulation for unrest and hostility and even worse things. 93. Sure, because various group members are not yet so far evolved that they can understand all of this completely. 94. In particular, their emotions will create a lot of uproar. 95. Sure, you are able to do that. 96. But also be clear to yourself about the fact that a lot of nonsense will be spoken, and that which you call “heckling” will be done. 97. In particular, someone will get together with Louis, in order to discuss with him, during undisturbed hours, nearly conspiratorial, nonsensical matters. 98. You will find all this out very soon. 99. Our probability calculations have yielded this, and indeed, very clearly. 100. I wouldn’t like to mention the name of the group member openly, because this one should become self-aware of his or her wrongdoings. But it would surely be better if you would mention the name, right? 101. No, not in this specific case. As you wish. But if I may drill once again: at what point in time will you transmit the contact report to me? If it takes too long, then there is the danger that you will forget different things, right? 102. No, the danger of forgetting does not exist, which you should know, because the transmissions are made directly through the subconscious, which is always aware of every detail, as you know. 104. I will have to wait with the transmission for so long until it has been decided that Louis has removed himself from the direct group relationship, because it is likely to give him the greatest difficulties, since he cannot understand that he will not be the father of the child of Eva, but rather you. 105. But he also won’t understand the relationship between you and Eva, just as many others also won’t. So that means that Louis will go away from the group? 106. Sure, if everything proceeds normally and isn’t wrongly steered and destroyed by irrationality and the wrong pity of those in the group standing in inappropriate connection with him or other group members some other time, then he will soon go away from the group on vacation for some time. I could gather from your words that I shouldn’t enlighten Louis further about the group matters and the contact conversations? Am I correct in this acceptance? 107. You are very perceptive; so it actually is, for the time being. 108. In this connection, in the future, you alone shall have the responsibility to decide to whom you will hand out the contact reports and to whom you won’t. 109. In this respect, you have to decide at your own discretion in the future. 110. But it is advised to you here that you make sure that Louis isn’t made accessible to any information that is psychologically burdensome for him – not even by additional or other group members. That won’t be so easy, however, because I cannot control our group members. 111. You very well can’t, sure, but the whole group itself must act in accordance with the statutes, if it becomes well-informed of a violation. 112. And it would be a violation of the statutes if a group member would pass on internal group knowledge. 113. The passing on of such knowledge to Louis would also be a violation because he currently never inserts himself mentally into the group and into its statutes, and therefore, already at present, he can no longer be considered as an active group member. 114. Only at a later time can he again be considered as a group member to the full extent, if he has overcome his serious personal problems, which he will also surely create. Once again, you know a damn lot. 115. I was compelled to occupy myself, in the last two days since my return, very intensively with all your concerns; consequently, I also had to encounter these things. Then you’ve plowed through everything? 116. Sure, because due to the appearance of the Nabulaner, I was compelled to inform myself about all things in detail. 117. Surely you understand, which is why it is also superfluous, that I give even more explanations and remarks.